In hockey, good goaltending can cover up for a lot of a team’s deficiencies. But it’s incredibly difficult to cover up for deficient goaltending. While it’s difficult to characterize the Calgary Flames’ goaltending without Mike Smith as deficient, it’s safe to say that the team is a lot better with him than without him. A recent injury to Smith has put the Flames’ goaltending in the hands of rookies David Rittich and Jon Gillies. While those netminders have generally been up to the challenge, the overall results with that duo in net – and with Smith absent from the lineup entirely – have been starkly different than those with him dressed. Through the first 66 games of the 2017-18 season, Smith has dressed for 55 games and missed 11 games due to a pair of lower-body injuries. The results in the 11 games he missed haven’t been amazing. With Smith out for one game in November, the Flames went to Eddie Lack. Lack (and Gillies, up temporarily from the AHL to back up) allowed eight goals by the Detroit Red Wings. Smith only missed one game, though, but Lack getting lit up led to his demotion to the AHL and eventual trade to the New Jersey Devils. More recently, Smith suffered a lower-body injury in the dying seconds of a 3-2 win over the New York Islanders on Feb. 11. In his absence, the Flames have relied upon the season-opening AHL tandem of Gillies and David Rittich. The results have been a bit uneven, with the Flames going 3-6-1 and the duo having performances ranging anywhere from one goal against (by Gillies on Feb. 24 against Colorado) to seven goals against (by Rittich on Feb. 21 against Vegas). While the Flames have been a consistently inconsistent club throughout this season, they’ve emerged as very Jekyll and Hyde in their outputs depending on whether Smith is dressed or not. Based on data from Natural Stat Trick, the team’s underlying numbers – their Corsi, Fenwick, Shots and Scoring Chances and the rates in which they generate them – are largely the same no matter who’s in net. But while their processes are the same, their outputs vary significantly. Jeckyl and Hyde season continues for the #Flames, win 2 in a row and follow it up with 2 losses. They’ve been nconsistent the whole season and it will bite them in the end. It’s no secret that Smith is an upgrade on two rookies and the numbers bear that out. The even strength save percentage with Smith dressed is .931, without him it drops to .875. Their goals against per game at even strength jumps from 2.00 to 3.00. But more troubling is the team’s offensive malaise without Smith; they score 2.18 goals per game at even strength with him dressed and just 1.45 per game without him. The team’s even strength shooting percentage drops from 8.1% with Smith dressed to 5.7 without him, and that’s with the same players playing in front of the net. The team’s even strength goal differential is +11 in games where Smith dresses and -16 in games where he doesn’t. A big component of both the goal differential and the team’s frantic play may be the team’s propensity to allow the first goal. The Flames have allowed the first goal in nine of 11 games without Smith and just 27 of 55 games otherwise. Life’s tough when your team has to chase the lead, particularly in the latter stages of the season when the margin between victory and defeat is razor-thin. The Flames are a jumpy team without Smith, particularly in games where they get down early. The challenge is two-fold: Smith’s replacements are rookies who are prone to gaffes (as young goaltenders tend to be), which leads to early deficits and the team chasing for the rest of the game. 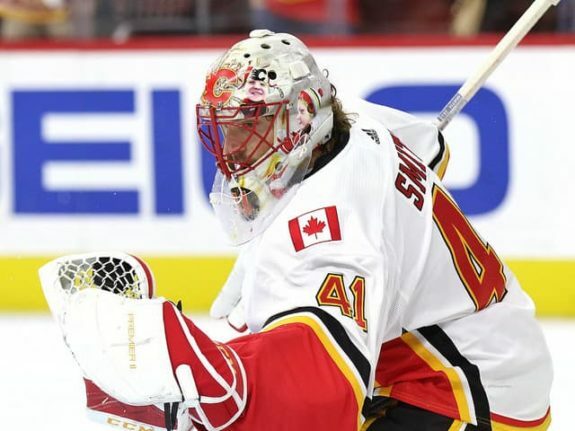 But the other challenge is that the Flames skaters are used to playing a particular way in front of Smith and their reliance on him in net prior to his injury – he was one of the most-used goalkeepers in the NHL when he went down – means they’re used to his tendencies and foibles, but not really used to Gillies or Rittich. A lack of familiarity leads to a lack of confidence, which definitely isn’t helped by the early goals that are being given up. Smith’s expected to return within a few weeks, but in his absence changes need to occur. Their young goaltenders need to be better, especially early in games, but the Flames’ skaters need to improve and make adjustments in front of them before their entire season is lost.